How to use jQuery selectors with examples. Difference between $(this) & this in jQuery? Does jQuery returns error if DOM element doesn’t exist? What is .bind() method do? And differ from .click() ? Differ between .bind(), .live() & .delegate()? All route object map route Url to MVCRouteHandler which implement IHttpHandler. 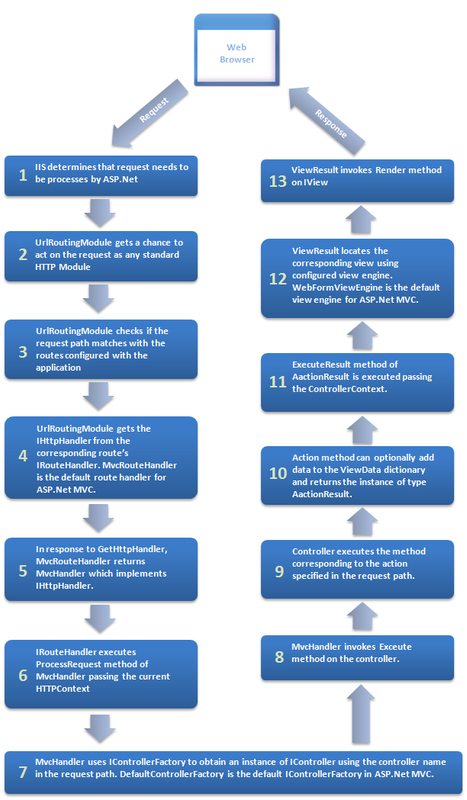 2) The UrlRoutingModule class matches an HTTP request to a route in an ASP.NET MVC application. UrlRoutingModule passes HttpContext object to RouteTable. The HttpContext object includes Url, form parameters, query string, cookies with the current request. 3) The MapRoute method being invoked inside of the RegisterRoutes method is an extension method. Every route registered with MapRoute is configured to use MvcRouteHandler, which is a RouteHandler provided by MVC framework. It is route handler job to find the HTTP Handler (which implement IHttpHandler) for a request, in MVC this handler is called MvcHandler. 4) When control reaches this MvcHandler, it extract the controller parameter from RouteData and send them to ControllerFactory. It is the factory responsibility to return a controller. All controller in MVC implement IController. MVC framework provide a default controller factory named DefaultControllerFactory that will search assemblies in appdomain to the Controller with implement IController & ends with Controller. Then the same instance is returned to the MvcHandler. When MvcHandler has a IController reference, it invokes the Execute() on controller. 5) The Execute() method extract members from the Request object and some of which act as method parameter. The Execute() method finds method of the controller by using reflection on Controller class. It finds the method (action) which matches the route and executes it. 6) When controller transfer to RenderView() method, the call is delegated to ViewEngine’s RenderView() method. It uses ViewLocator class to find the View. And all master page, ViewBag, ViewData are set.